Born Johann Dobnek in Wendelstein, near Nuremberg, Johannes Cochlaeus (1479-1552) graduated MA from the University of Cologne in 1507. 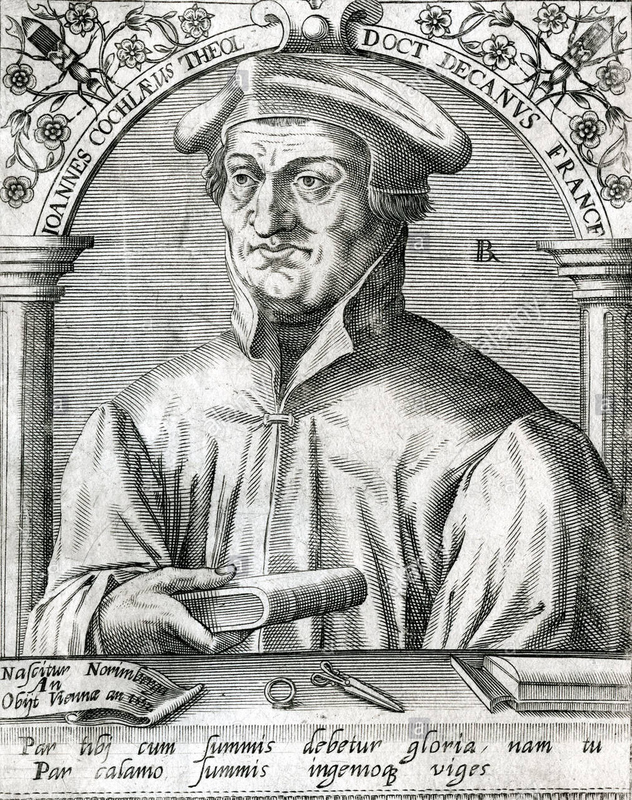 A talented humanist scholar, Cochlaeus was a prolific writer and in a two-year period, around 1510, he published four scholarly editions including one of Pomponius Mela’s Cosmography. Cochlaeus went on to receive his doctorate from the University of Ferrara in Italy in 1517 and was ordained as a priest in Rome in 1518. In 1528, he became the court chaplain to George, the Duke of Saxony – a staunch opponent of the Reformation. Over the course of his career, Cochlaeus would become the ‘most prolific and most acerbic of Catholic polemicists’ (Keen, 2002). ___, “Johannes Cochlaeus,” ourheritage.ac.nz | OUR Heritage, accessed April 24, 2019, http://ourheritage.ac.nz/items/show/10361.